It is no secret banks are losing customers, and fast. A recent Finextra/Pegasystems survey pegs that 78% of banks have lost business in the last 12 months. The question is “Why?”. It all comes down to engaging with customers before, during and even after the sales process. Nearly all banks are struggling with the impact of client due diligence and KYC (know your customer) regulation on their onboarding processes, and are painfully aware that lack of speed, process visibility and repeat data requests are frustrating their corporate customers. The same holds true for service, where corporates are crying out for improvement, as well as omni-channel access and quick turnaround of service requests and inquiries. To stop the sales decline, banks need to begin doing all these things well. They will then be more competitive in the market as well as retain and win new business. 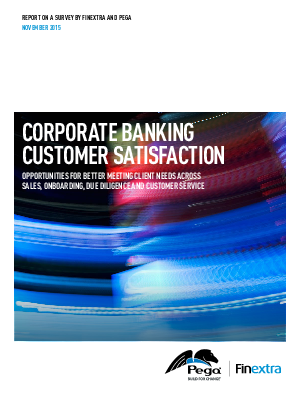 Download this research study and gain a better understanding of how banks can better meet the needs of their customers.